Spending time in nature – whether a forest or a public park – improves health and wellbeing. Photo by Gryffindor, courtesy of Wikimedia Commons. Although the benefits of urban forests, gardens, parks, and other green spaces have been documented, the nuances of this relationship continue to be explored. For example, the role of green spaces in the social aspects of public health are often overlooked. My colleagues Lincoln Larson (Clemson University), Jessica Yun (Georgetown University) and I recently explored the relationship between green spaces and the social factors that influence health. Our study was published in the International Journal of Environmental Research and Public Health, and creatively connects ecosystem services such as aesthetic surroundings and outdoor recreation, with social determinants of health. Social determinants of health include factors such as neighborhood and the built environment, economic stability, and social context. These categories are multifaceted: for instance, neighborhood and the built environment involves access to healthy food, crime, environmental conditions, and violence. The U.S. Department of Health and Human Services outlines a variety of social determinants of health in its Healthy People 2020 framework. Interaction between green space and social determinants can potentially enhance social cohesion, community revitalization, academic performance, and human wellbeing. As we articulate the relationship between green spaces and wellbeing, we also extend the discussion to include socioeconomic variables such as race, ethnicity, and levels of income. Such observations can have implications for environmental justice. 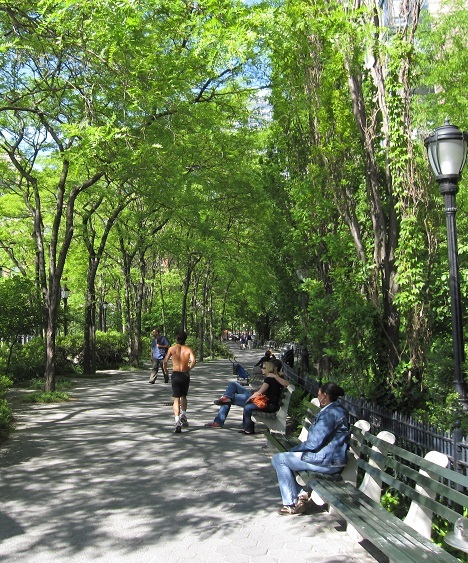 Parks, for example, provide a unique form of social gathering space in congested cities. The social interactions and collaboration that parks facilitate could have lasting impacts on community wellbeing. In addition to this paper, Larson, Scott Cloutier (Arizona State University) and I recently published another article in PLoS ONE that examines the relationship between public parks and wellbeing in 44 U.S. cities. The most important predictor of wellness was the quantity of urban green space, which was measured by the percentage of city area covered with public parks. The strength of this relationship appeared to be driven by parks’ contributions to physical and community wellbeing. Even though park quality, which was measured by the per capita spending on parks, contributed to wellbeing, the relationship with health was not as strong as expected. Similar findings were observed for park access, which pertained to the percent population within a half mile of parks. Overall, the strong relationship between park coverage and health suggest that expansive park networks are linked to multiple aspects of health and wellbeing in cities and positively impact urban quality of life. By connecting the dots between the frameworks of ecosystem services and public health, we are better positioned to cross disciplinary boundaries in a way to effectively approach issues in urban areas. Viniece Jennings is a research scientist with the Integrating Human and Natural Systems unit of the Southern Research Station. Read the full text of the International Journal of Environmental Research and Public Health article. Read the full text of the PLoS ONE article. For more information, email Viniece Jennings at vjennings02@fs.fed.us.